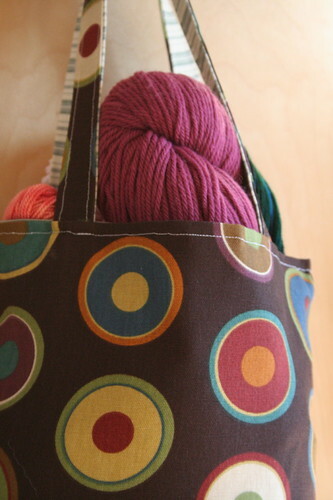 A few weeks back, I won the most fabulous blog contest prize ever: a beautiful bag made by Nova filled with yarn! Check this out! The prize came all wrapped up late this week. I’ve saved the ribbons for some summer dresses for B too. Thank you so much for such a lovely prize, Nova!!!! I’ve been stewing about what I’ll do with each skein! More on that later, to be sure. What’s that hand doing in there? Hey, wait! Put that back! I was trying to take a picture of the yarn! Come back here! I chased Beatrix around the living room to get the yarn back but when I found her standing like this, I pulled out the camera. What do you think? Is she coveting yarn? I hope this means I’ll be able to teach her to knit someday. 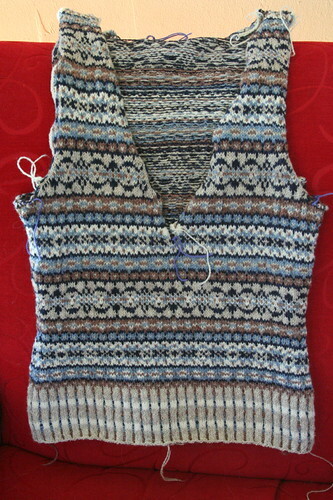 I’ll leave you with some photos of a nearly finished Ivy League Vest. Hopefully, I’ll have a full report for you next week! **Ack, sorry for the wretched pun, Nova! Oh. My. Gosh. These are the cutest pictures ever! I love how she has her face snuggled down into the yarn. And your vest is amazing! 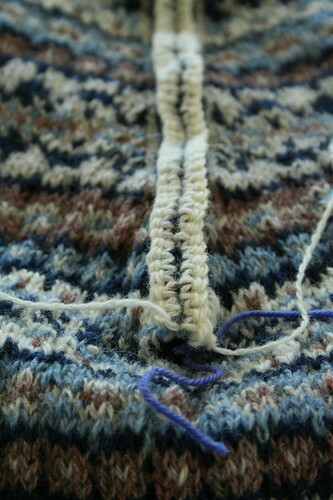 Yayyyyyy, steeking! And hurray for your package and the young yarn love. That vest looks awesome! I love it so far! ahh you lucky duck, that bag is gorgeous and packed full of wonderful yarn. Miss B just keeps getting cuter and cuter, next your going to find her in a corner somewhere knitting away 🙂 Precious! Your really rocking that vest, can’t wait to see the completed version. Baby B has some good taste in yarn and color! And as many times as I’ve seen people cut steeks, it still stresses me out! 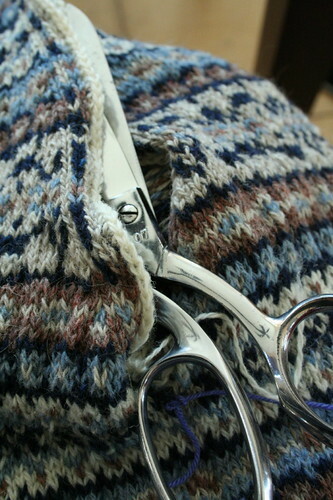 I love it when the knitting gets cut, and the weirdly-misshapen object finally unfolds and takes shape. I’ll never get tired of seeing the before and after of a steek! Oh what a wonderful prize. At least your daughter knows which ones are the softest, and has great taste in choosing yarn too, they go well together. How adorable! I think we have another yarn hugger on our hands 😉 Pretty vest….can’t wait to see the FO pics. Nova is amazing, but Elinor! That colorwork blows me away. Can’t wait to see it all finished. What a fabulous prize!! 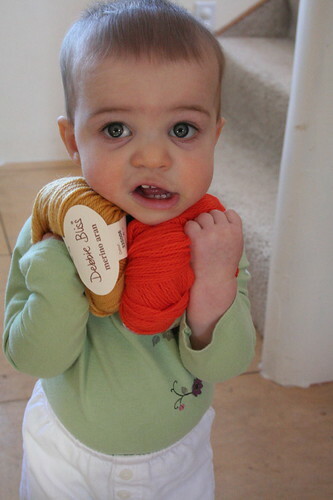 Aww – pictures of Beatrice and the yarn are almost enough to make up for the horror of the scissors! Okay, those pictures of B with the yarn are just too cute. (I love her shoes, too!) And your vest is amazing! Beautiful photos! Seeing your Baby B *almost* makes me wish for my own! Not for another few years, though. 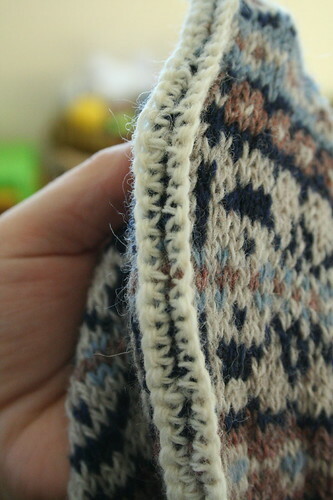 Seeing your photos of the steeking is making me feel a little braver about trying it. I can’t wait to see the finished product. Wow, even knowing that the steeking went o.k., the photos are terrifying! Not to mention baby snatching yarn . . . very scary! 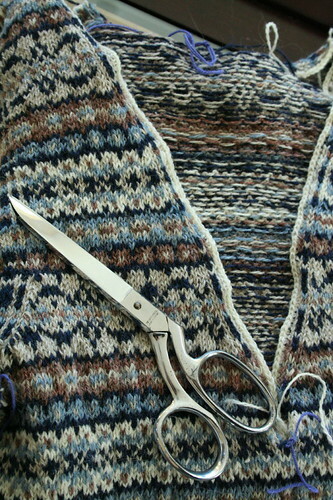 steeking is very scary – nice work on the vest, looks fab. 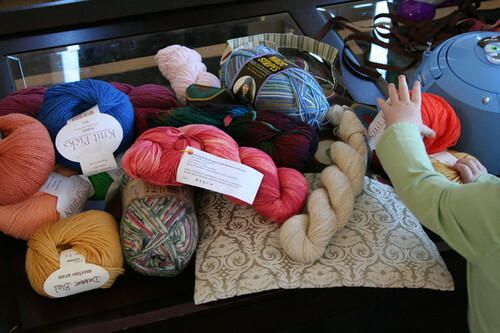 Love the pics of you daughter & yarn – so cute! look at all that yarny goodness! what a great prize! Beatrix seems to be well on her way to establishing her own little stash! the vest….wow…i’m so not a vest person, but i love it! Look at that VEST!!! It’s amazing! Oh.my.gosh! That’s like the prize of all contest prizes! Congrats! Did Beatrix ever relinquish the yarn? She certainly does look like she’s in love. 🙂 And the vest is looking fantastic. Lovely vest! Beatrix is doing exactly what I do with my yarn 😉 Good to see it’s in her genes… Perfect shot! The vest looks amazing and I can’t wait to see pictures of it on. 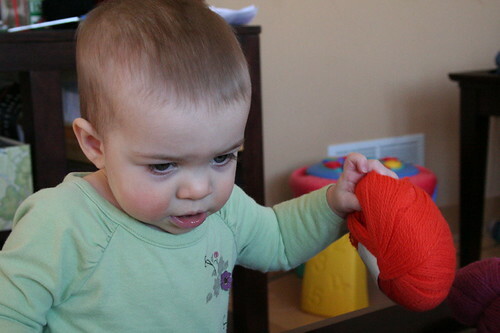 E – I’m pretty sure that is the exact same way I’ve seen you fondling yarn at the yarn store… she’s learning from the best! You are so welcome, Elinor! It makes me happy to have sent it to such a good home where it is loved by all. I love it when the kids love the yarn. That vest, by the way, awesome. Awesome. Oh, my your daughter is so gorgeous and cute! You are super lucky to have won this prize and to have such an amazing daughter!